Dome Cars | American Train Vacation | 817-696-1507 | America's Trains Inc. The upper level of Dome cars is located near the center of the car with stairs at one end. The upper level provides optimum viewing of passing scenery. Dome cars offer multi purpose capabilities. There are two Grand Suites or three Master Suite bedrooms, a full or service kitchen, lounge and/or dining areas. Car configurations provide operating flexibility that allows them to be used in Train Sets having from two to five Cars. Dining and lounge layouts are changed based on specific Journey objectives and passenger interests. Dome cars can’t normally operate in the northeast USA because of height restrictions. After repairs are completed, America’s Trains plans to introduce the one car that is lower and able to provide service north of Washington, DC. 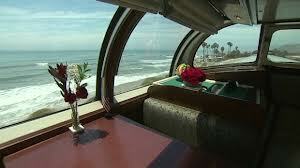 America’s Trains dome car quality and characteristics exceed or equal the world’s best.